White House employs more than 450 people. More than 20 White House staff members earn around $172,200 annually! Here are the top 10 highest paid White House staff members, according to the White House’s annual staffer salary list. Cecilia Munoz has been serving as the Director of the Domestic Policy Council since January 10 2012. 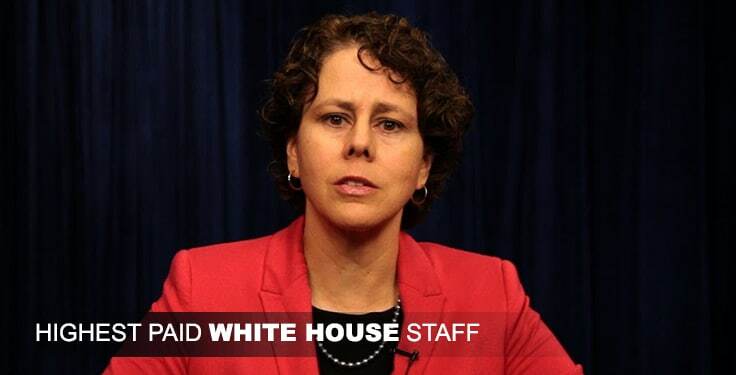 She has also served as the White House Director of Intergovernmental Affairs. She is a civil rights advocate. In 2000, she was named a MacArthur Fellow for her work in this area. Rob Nabors serves as White House Deputy Chief of Staff for Policy for US President Barack Obama. He assumed the office on January 25 2013. He has served as Director of Legislative Affairs in the administration. He has also served as Deputy Director of the Office of Management and Budget and Senior Advisor to Chief of Staff. Currently Jennifer M. Palmieri serves as Assistant to the President and Director of Communications. She has served as the President of the Center for American Progress Action Fund. She was the National Press Secretary for the 2004 Edwards for President Campaign and the National Press Secretary for the Democratic National Committee in 2002. Howard D. Pfeiffer is Assistant to the President of the United States of America and Senior Advisor to the President for Strategy and Communications. He was previously a member of Obama’s presidential transition team, and served in various press and communications roles throughout Obama’s 2008 campaign. White House announced on February 4 2015 that he would resign his role at the White House within a few weeks. Peter M. Rouse is an American political consultant. Currently he serves as the Counselor to the President. He has spent years on Capitol Hill, becoming known as the 101st senator during his tenure as Chief of Staff to Senate Democratic leader Tom Daschle.